Home was elusive for Frederick Siddaartha Crocker, native of West Virginia, son of an itinerant Pittsburgh wildcatter, scion of 19th century Oriental spiritualists, ensign whose ship the USS Terror was hit by a kamikaze. 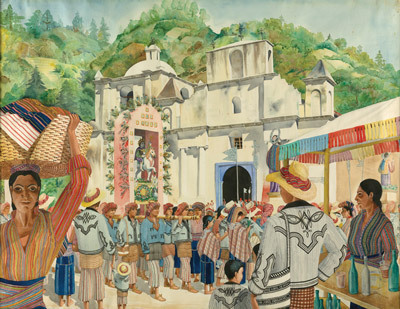 “Pat,” as he was known throughout his life, went native for a time in the Philippines, fell in love with Taxco and then came to the Land of Eternal Spring. Pat was my paternal uncle. He was legendary in our family mostly, I think, because of his unsettled temperament; he was a man who studied art and architecture at the Carnegie Institute, but who could not seem to establish – or circumstance prevented – a stable lifestyle. That changed in early 1940 when he came to Guatemala. From that moment the family legend reached almost mythic proportions as reports of his success as both artist and architect reached home. I met Tío Patricio when he came to Santa Fe, New Mexico, when I was 12. By that time he had established himself firmly as an expatriate in La Antigua Guatemala and had restored a number of colonial homes for clients, including Gore Vidal (Casa del Carmen), Whiting Willauer and Aubry Trik (Casa Doble) and the Pellecers. He joined the first archeological season at Tikal in 1956 designing the interpretive trail system and the first, elegant museum at the site. He was invited to participate by his friend, Ed Shook, field director of the University of Pennsylvania’s Tikal Project. In 1959 my mother, sister and I reciprocated the visit. I would return to Guatemala many times after that, but it was during that trip that I witnessed Pat’s brilliance for the first time. We stayed in Casa Doble and visited other of his projects, both finished and underway. 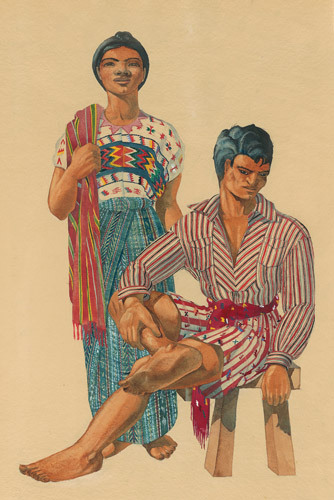 At his home in Panajachel I saw for the first time the unbelievable collection of 34 watercolors thematically titled Trajes de Guatemala. They hung frame-touching-frame around three walls of his sala and had been researched and painted during his first 10 months in the country. Talent was not all that was on display. Pat had settled into the lifestyle that he craved; he dressed casually and would be seen walking from job to job in Antigua with a bolsa típica over his shoulder. He was by nature an early riser, an impressive characteristic given that the first bottle of rum was opened around 11 a.m. The rest of the day was spent socializing. There was a party, somewhere, nearly every evening that lasted to the wee hours. Sadly by 1963, the last time I visited him, Pat had achieved his magnum opus and had settled into a state during which much less time, if any, was spent creatively. Nine years later, on Dec. 8, 1972, Pat died in Antigua at the age of 58. Earlier that year, in order to pay medical bills, Pat sold the collection and all of the ancillary drawings and notes to his old friend, herpetologist Larry Stuart. Larry removed them from their frames and stored them in an old toilet seat box that he kept safely on the top shelf of his closet. There it lay un-looked at for seven years. Over Christmas in 1979 I accepted an invitation from Ed and Ginny Shook to be their guest at Casa Santo Domingo, a ruin that they had turned into their home and Ed’s lab. During the stay, over bloody marys one Sunday morning, I inquired after Larry. Ed noted that he was alive and well and living in a house that Pat had designed for him in Panajachel. That very afternoon I made a momentous cold call. I found Larry at home and very pleased to speak with me. I asked if I might come up to the lake and see the paintings. 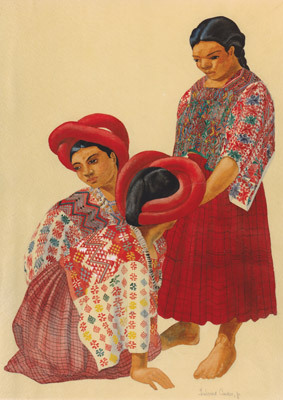 The next day I drove to Panajachel and after viewing the watercolors timidly asked if they could be purchased. Without hesitation he offered the collection for the same price he had paid Pat. We sealed the deal over warm gin and tonics, I wrote three post-dated checks and drove back to Antigua with the paintings. It is Larry Stuart to whom all thanks are due for protecting and passing on Pat’s legacy. Then, for 36 years I pondered, as the paintings hung all around me, how I would fulfill Pat’s dream to have his work published. The goal of publication was passionately shared with the late Dr. Peter D. Harrison, veteran excavator of Tikal and a close friend of Pat’s. Peter and I spent years, off and on, inventorying and chronologically organizing the material. In all, it amounts to roughly 2,500 documents, drawings, correspondence, photographs and, importantly, detailed notes on each traje. After Peter’s death I finally accomplished the goal of assembling all of the material in a manner that would be useful for either publishing or curating. In 2010, at the urging of photographer Leslie Claxton Wilson, who grew up in Guatemala City, I convened a gathering in Santa Fe of some 30 people interested in traje who might have connections or ideas for publishing. All of the paintings were on display. Many good thoughts surfaced and I followed up with an Internet inquiry to every institution in the U.S., Latin America and Europe that I could identify with relevant programs. Three responses were promising, but the clincher came unexpectedly in July 2012 when I was hired to underpin an old adobe house in Santa Fe. Anthropology Professor Robert M. Hill of Tulane was (is) the owner of the unfortunate building. Finding that he taught at Tulane, my own alma mater (1970), we struck up a conversation while successfully rescuing his house. Over the next 2½ years we led the collection on a straight path to the Middle American Research Institute (MARI) at Tulane. By the time Bob and I struck our deal (this time the gin was on ice), I had already begun having the collection reproduced in gicleé prints of exquisite quality by John Baker of High Desert Arts in Santa Fe. By March 2015 I had packaged and dispatched the entire collection to Tulane in New Orleans. Bob edited Pat’s extensive notes into a catalog, and MARI ordered 100 complete sets of full-sized prints, all 34, boxed with the catalog and available to interested buyers (tulane.edu/~mari/index.html). 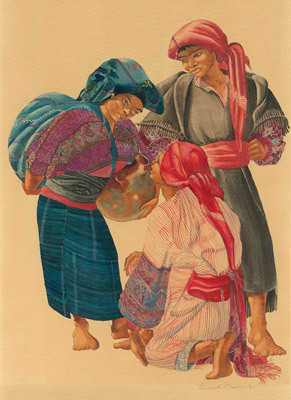 The sales began even before the originals had been processed into MARI’s permanent collection. Pat’s search for a home took him through the oilfields of Oklahoma and the ruins of Nagasaki. 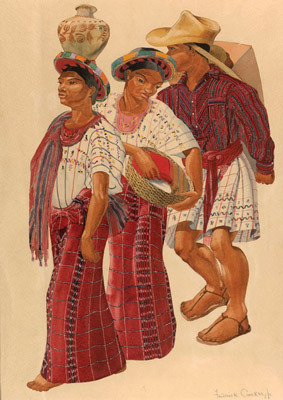 His Trajes de Guatemala, a sustaining artistic and cultural contribution, followed a similarly winding road. They have found their elusive home, too. REVUE article by Edward Crocker. Images in this article reproduced with permission from Tulane University, New Orleans, LA, a private, nonsectarian research, Marcello Canuto, director of MARI and Bob Hill.